Keep in a dry and cool condition. 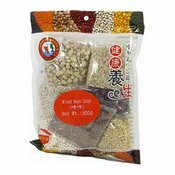 Ingredients: Cowpea (17%), Red Kidney Bean (13%), Big Sago, Wheat, Coix, Red Rice, Barley. Simply enter your details below and we will send you an e-mail when “Mixed Bean Soup (喳咋)” is back in stock!